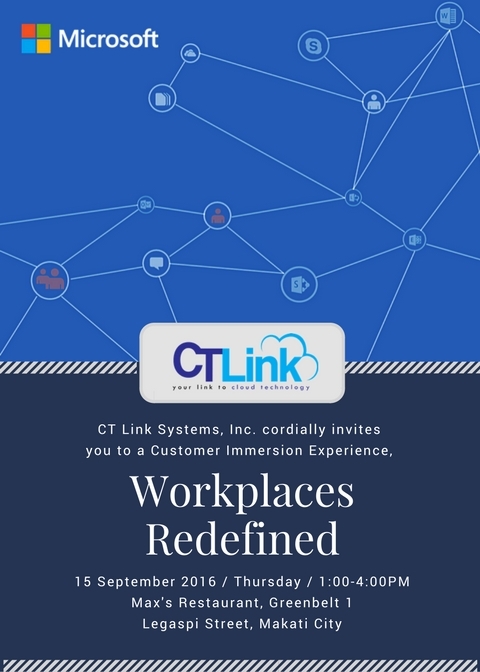 Workplaces Redefined – A Workshop by Microsoft and CT Link Systems – CT Link Systems, Inc.
Facebook is the top Social Networking site. But Facebook may not be the appropriate place to share corporate information. There are also many instant messaging tools such as Viber, WhatsApp, Line or Yahoo Messenger available but an organization does not have oversight nor control over the communications going thru these channels. Microsoft’s vision for Enterprise Social is driven by a product roadmap including Yammer, Office 365, SharePoint Online, Dynamics CRM and Skype for Business. These tools are designed with Security, Integration and Collaboration in mind. The Enterprise Social space is both hot and fragmented. Over the next 12-18 months, most Enterprises will define their strategy for Enterprise-Social solutions, whether focused more broadly on team collaboration, or more specific to areas such as accelerating innovation, engaging employees, etc. In this workshop, Microsoft and CT Link Systems would like to share the trends in Enterprise Social Networking and will demonstrate how these tools can help increase productivity and enhance collaboration in work places. Join us to experience how Yammer and Skype for Business can transform your work space.